Luol Deng scored a season-high 24 points and Derrick Rose added 19 as the Chicago Bulls won their fifth straight, 112-91 on Friday over the Cleveland Cavaliers, who were without rookie guard Kyrie Irving. Up by 12 at halftime, Chicago built a 24-point lead in the third quarter and coasted to its 12th win in 14 games to stay on Miami's heels for the best record in the Eastern Conference. 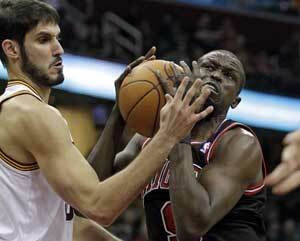 Carlos Boozer added 13 points and 11 rebounds as the Bulls won their seventh straight over Cleveland. Irving has been fighting a flu bug for several days and missed his fourth game. The Cavs sorely missed their leading scorer and playmaker while dropping their fourth straight. Antawn Jamison scored 22 for Cleveland, 0-3 since the All-Star break.